Members of the Navajo Nation and Hopi Tribe were out with their picket signs outside the Arizona Capitol Tuesday, protesting the closure of the Navajo Generating Station and the Kayenta Mine. The coal mine and the power plant where the coal has been processed for the last 40 years are set to shut down by the end of 2019. That is, unless a new owner shows up, which doesn’t appear to be happening. And, well, these tribal nations aren’t too happy about it. The Kayenta Mine—the state’s only operating coal mine—and the Navajo Generating Station have been a major source of employment and income for the Navajo Nation and Hopi Tribe: 90 percent of the plant’s employees are Navajo, and 99 percent of mine employees are Native American. According to data shared by the Navajo Nation Council last year, revenues from the mine and plant make up 80 percent of the Hopi Tribe’s general budget and more than 30 percent of the Navajo Nation’s annual revenue. And the utility owners have also been clear they want to work with the tribal nations to involve them in future energy projects throughout the state, like expanding the Kayenta Solar Farm, but that’s not enough for many members of the Navajo Nation and Hopi Tribe. They just don’t want to see their livelihood in coal end—and, after all, President Donald Trump promised them (and countless other coal workers) it wouldn’t have to. Interior Secretary Ryan Zinke said in a statement to The Washington Examiner Tuesday the department was committed to keeping the plant open, but presented no formal plan. More than 200 people were protesting Tuesday, according to The Associated Press. 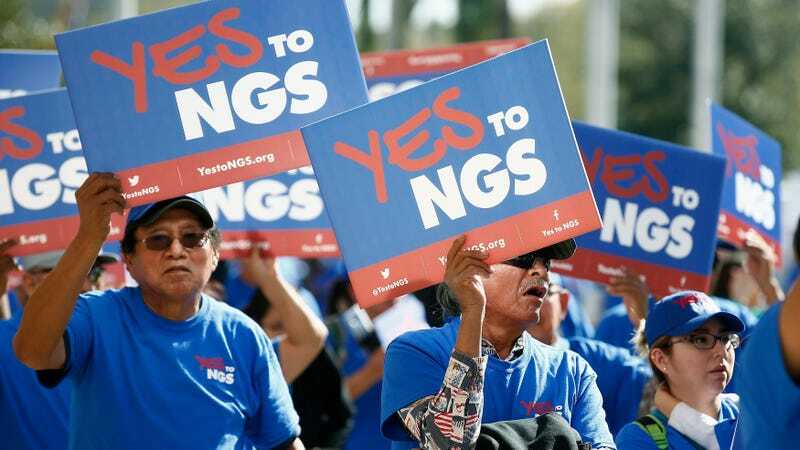 They announced a new coalition: “Yes to NGS.” This coalition aims to advocate for solutions that’d keep these facilities open past 2019. The salary for power plant workers is, on average, $141,500, and that’s seven times more than the median earnings of people on the reservation. That kind of a salary goes a long way, and a job at a nearby facility keeps families close—to each other and their Native culture. Many workers, like Myron Richardson, a 42-year-old Navajo welder at the mine, worry they’ll have to up and move once the mine and power plant close. “It would be like starting all over again,” Richardson told the AP. The issue is complicated and divisive among these tribes. Though coal is a source of income, processing it at the plant creates major pollution: 5,000 tons of sulfur dioxide and 20,000 tons of nitrogen oxides (both of which are harmful to the respiratory system and contribute to smog and particulate matter formation) a year, to be exact. At the end of the day, though, the issue comes back to tribal sovereignty and the Navajo and Hopi’s ability to make their own decisions to benefit their families. That’s what many, at least, argue.